We moved to a new instance of the chat system recently (7.2.2016). You will be required to re-register to use the new chat instance but you can use your previous username and password to register in the new version of the chat. JabbR will ask you to register with a username and password the first time you log on. Please make sure you write this down somewhere. We can not retrieve passwords. Posting comments in the chat: The text box at the bottom of the page is where you type in whatever you want to say. Then hit send. 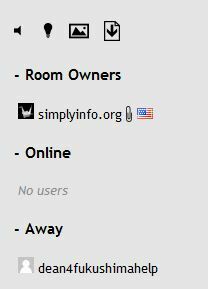 Make sure you are in the room labeled “SimplyInfo”: People can end up in the lobby and not be able to post, just click on the other room tag to join. Posting images, video or documents: cut and paste the web address of the image or video into the text box and hit send. Make sure you give the web address of the image, not the website the image is on. For video the web address of the video should be enough to make it automatically load the video into the chat conversation. Documents need to be uploaded to some place like Google Documents, Scribd or other web hosting. Like ScribbleLive, JabbR doesn’t have an ‘upload” option to upload directly from your hard drive to the chat. What the list and buttons on the right do: The right side list shows who is online, who are room owners, and who is currently away but logged in. Room owners can help answer questions or remove a user if someone is causing trouble or posting inappropriate content. The list of symbols across the top do certain things. The speaker toggles sound on or off, this makes a beep when someone posts a new comment. The lightbulb toggles pop up notifications for Google Chrome. With that option on you will get a pop up message any time someone posts to the chat room. The picture toggles between plain text and rich text display. That can be used to not get images and emoticons, this is helpful if you have a slow internet connection. The arrow down button allows you to download chat history, you can pick how far back you want to capture and download conversations. The download is as a json file. There are various tools for converting or viewing json files. Add a nation flag to your profile – you can add a flag icon next to your name on the right to show people where you are located. Add a note to your profile – this can be useful to tell people more about yourself, any groups you belong to, your website address or how to contact you online. Type /note then whatever you want to put in your note to be beside your name. Don’t for get the space between /note and whatever you wish to add. Send a private message – Type /msg @nickname (message) to send a private message to nickname. @ is optional. to do various things in the room you only need to type certain things into the text box and hit send. Typing in /help will bring up the list on your screen at any time you need to determine how to do a command. msg – Type /msg @nickname (message) to send a private message to nickname. @ is optional. leave – Type /leave to leave the current room. Type /leave [room name] to leave a specific room. gravatar – Type /gravatar [email] to set your gravatar. invite – Type /invite [user] [room] – To invite a user to join a room. nudge – Type /nudge to send a nudge to the whole room, or “/nudge @nickname” to nudge a particular user. @ is optional. kick – Type /kick [user] to kick a user from the room. Note, this is only valid for owners of the room. logout – Type /logout – To logout from this client (chat cookie will be removed). addowner – Type /addowner [user] [room] – To add an owner a user as an owner to the specified room. Only works if you’re an owner of that room. removeowner – Type /removeowner [user] [room] – To remove an owner from the specified room. Only works if you’re the creator of that room. lock – Type /lock [room] – To make a room private. Only works if you’re the creator of that room. open – Type /open [room] – To open a closed room. Only works if you’re an owner of that room. close – Type /close [room] – To close a room. Only works if you’re an owner of that room. allow – Type /allow [user] [room] – To give a user permission to a private room. Only works if you’re an owner of that room. unallow – Type /unallow [user] [room] – To revoke a user’s permission to a private room. Only works if you’re an owner of that room. note – Type /note – To set a note shown via a paperclip icon next to your name, with the message appearing when you hover over it. afk – Type /afk – (aka. Away From Keyboard). To set a temporary note shown via a paperclip icon next to your name, with the message appearing when you hover over it. This note will disappear when you first resume typing. flag – Type /flag [Iso 3366-2 Code] – To show a small flag which represents your nationality. Eg. /flag US for a USA flag. ISO Reference Chart: http://en.wikipedia.org/wiki/ISO_3166-1_alpha-2 (Apologies to people with dual citizenship). topic – Type /topic [topic] to set the room topic. Type /topic to clear the room’s topic. roomname – Type #roomname to add a link to that room in your message. Eg. If you add “#meta” to your message it will be replaced with a link to /#/rooms/meta. broadcast – Sends a message to all users in all rooms. Only administrators can use this command.